Wanna special getaway? 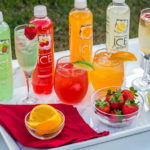 Let Dana Hotel and Spa treat you right! 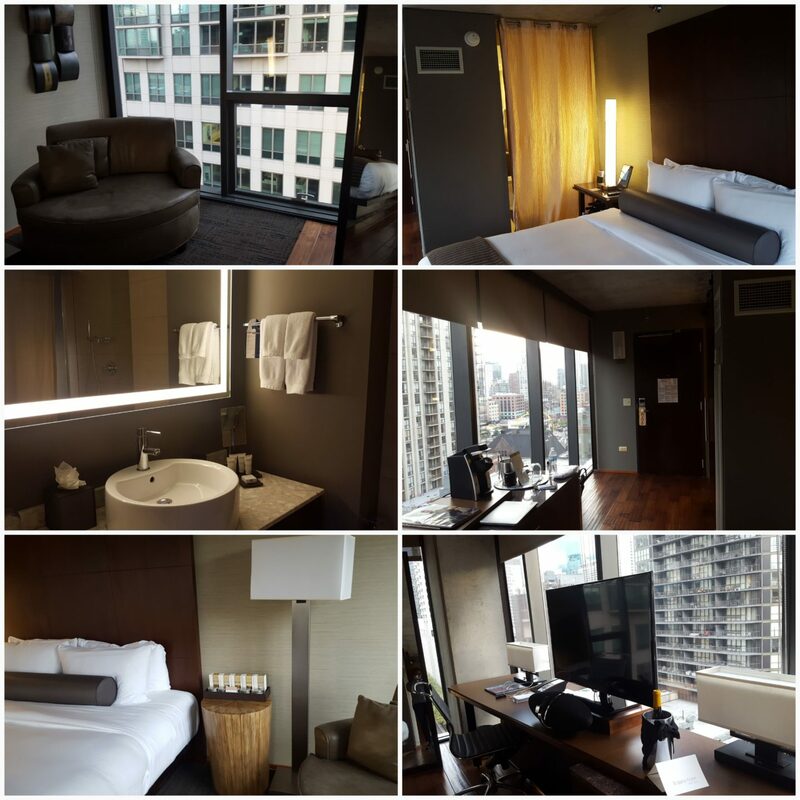 Dana is located in River North (Chicago) at State and Erie smack dab in the middle of everything! After a warm greeting from the doorman, I entered the lobby where Portsmith, the hotel’s seafood restaurant, is located. I’m then escorted to the glass elevator for a quick trip up one floor to a modern, contemporary lobby. Contemporary can sometimes mean cold but not the case here. The sleek and contemporary lobby Dana Hotel and Spa presents is welcoming and aesthetically pleasing. Also, on the lobby level is the Leviathan Cocktail Lounge with a nice bar and plenty of comfortable seating. 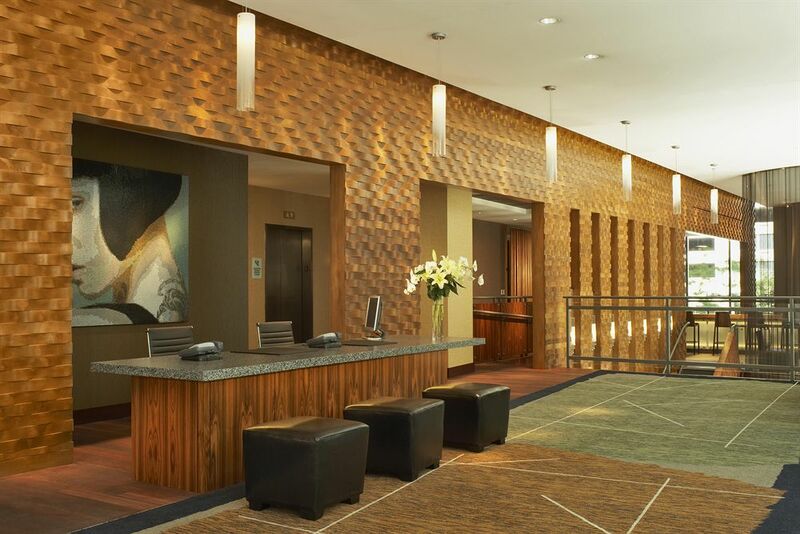 There’s only one thing missing from this beautiful lobby, YOU! The location in a word is awesome! Close to absolutely everything and if you don’t want to leave the property they have that covered. There’s 24-hour room service and Apogee a rooftop lounge open weekends. So many great restaurants I enjoyed a few, lots of nearby shopping and entertainment options all within easy walking distance. King Corner Room – what a view! Entering my room I paused to take in the awesome views from the two walls of floor to ceiling windows looking south onto State Street. I was impressed that I could see all the way down State Street past the Chicago Theatre marquee and east to the sphere rising high above Trump Tower. The room was well appointed with a really nice wood desktop displaying the TV, sound system and ample workspace. While working on my laptop I was able to enjoy the view. As a self-proclaimed wine aficionado, I was thrilled to discover not only a nicely stocked wine fridge but a wine rack housing a good selection of reds next to the bed. After checking the prices on the wine list I was pleased the selections were actually quite reasonable. 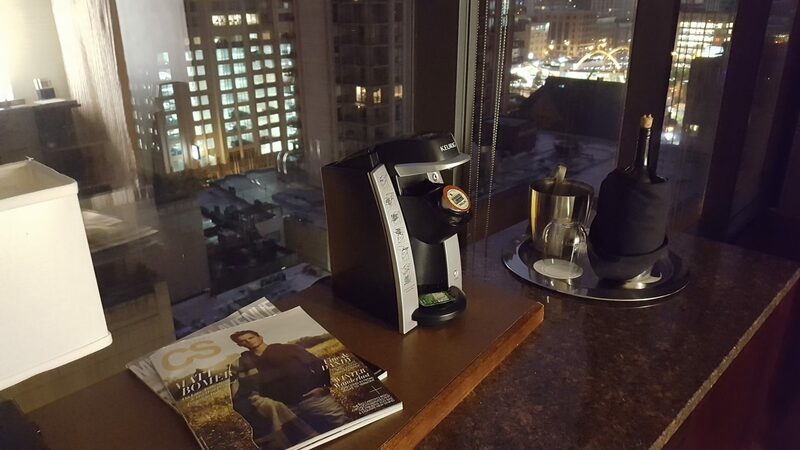 A Keurig with a selection of coffee was another thoughtful addition. 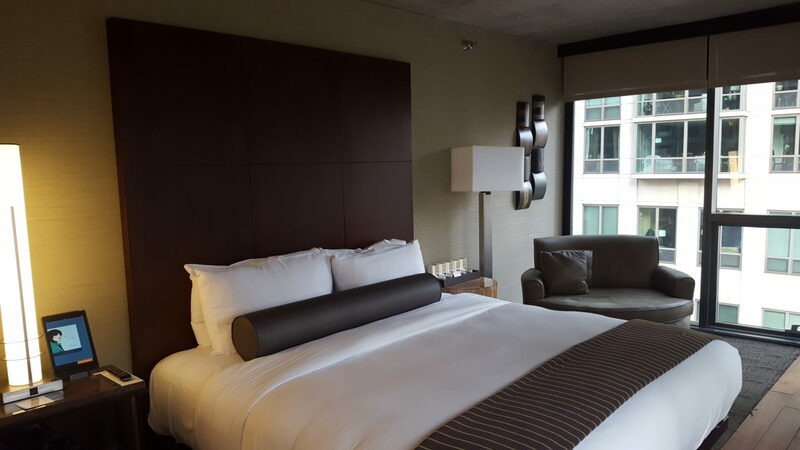 That bed was truly amazing and although I could hear the sounds of downtown Chicago, I slept like a baby on the quality linens and comfy mattress. The ceilings are unfinished concrete and, in my opinion, add to the unique aesthetics of the property. I loved the partial wood flooring paired with carpet. A great spot to relax with a book, enjoy a glass of wine and the view is the comfortable love seat next to the window. It’s obvious some thought went into the space plan because the room was very spacious and well laid out. The bathroom is a good size with a huge, amazing shower that was absolutely wonderful. I loved the barn door for the bathroom but it was problematic keeping it closed, a minor adjustment should remedy it. The curtained, glass wall also in the bathroom is something I was a bit ambivalent about but because I was traveling solo it wasn’t a problem. However, when sharing a room be certain it’s someone you’re very comfortable. That touch might work for a romantic weekend but not so much for a girls trip. I was pleased that the room was clean and well-stocked with towels and amenities. The I-Pad in the room was a nice addition for requests including turn-down service, ordering room service, etc. I didn’t use it but for a longer stay, I would’ve used it to treat myself to the turn-down service. The gym and the spa are located on the 4th floor and I was pleased to that the women’s locker room included a steam room, one of my favorite things. 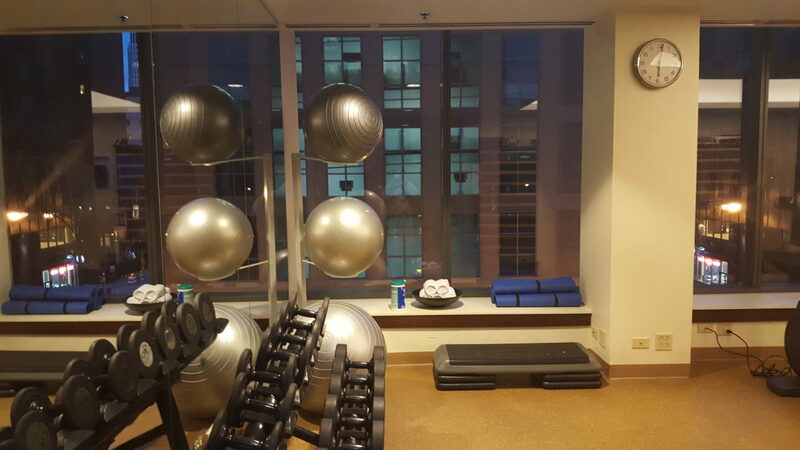 The gym is well stocked with the usual equipment and I especially liked while using the treadmill I could people watch through the floor to ceiling windows. The locker room was clean and well-stocked. 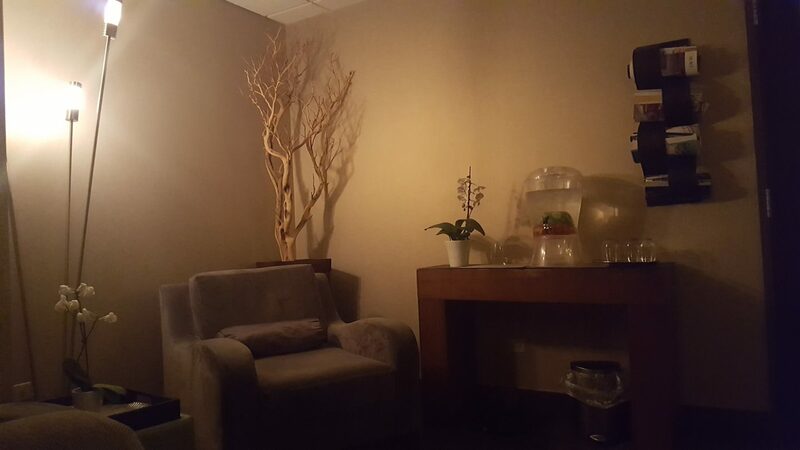 Waiting for my message to begin I was escorted from a beautiful waiting room to a relaxation area. The tranquil room is decorated in soothing earth tones, with comfortable lounging settees, soothing lighting and soft music piped in. The wait was too short for me to enjoy the room but I was advised I was welcome to return. Kudos to my masseuse, Clarice, she did an awesome job being certain to inquire that the amount of pressure was okay and inquiring about problem areas. The quality of the linens and the heated massage table truly enhanced the message. 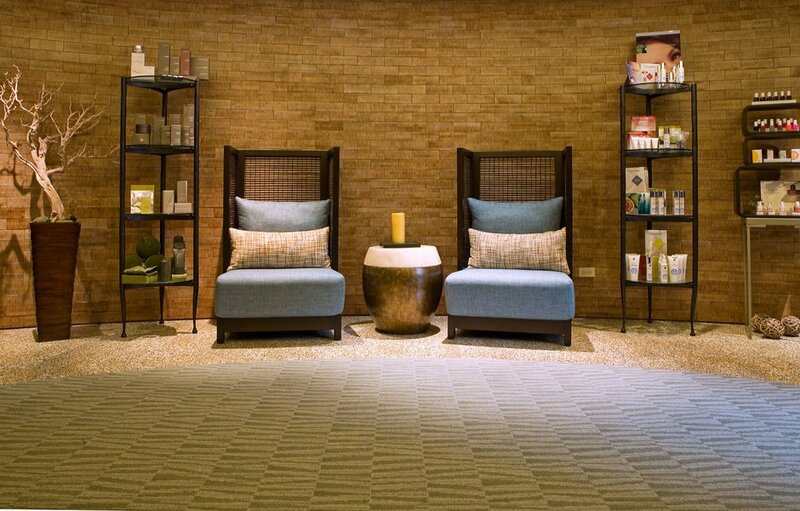 The entire spa experience exceeded my expectations and was one of the highlights of my stay. 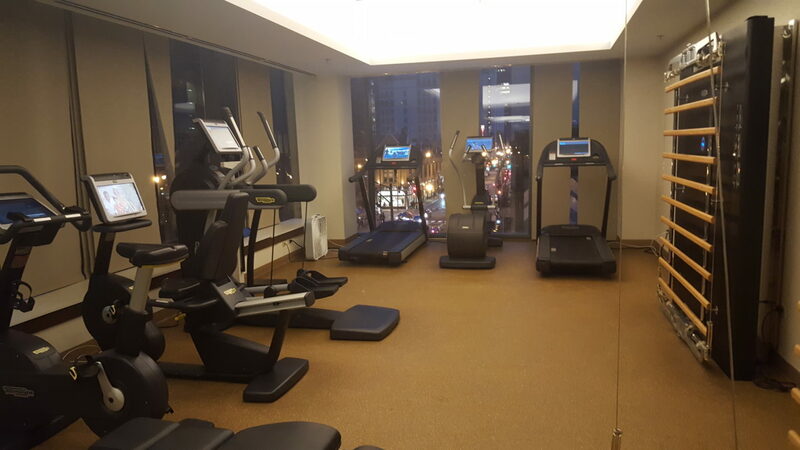 Rather you are checking out Chicago for a quick getaway or treating yourself to a staycation, Dana Hotel and Spa will exceed your expectations. This upscale boutique property offers many specials that make it affordable. When traveling location is of the utmost importance and Dana offers a great location with so many added bonuses. Truly the complete package!